Secretary-General Ban Ki-moon on Sunday told what is thought to be the largest ever march in the United States demanding measures to halt the advance of global climate change, that there is no "Plan B" for action as there is no "Planet B." Speaking to journalists after walking with an estimated 300,000 demonstrators on the People's Climate March through New York City on Sunday he said the world needs to "galvanize our action" and harness the people's "power to change." As the clock ticks down to the Secretary-General's much-anticipated Climate Summit at UN Headquarters two days from now, politicians, celebrities, activists and the general public marched though the city to highlight global concerns about a lack of international action to stop the deliterious effects of climate change. The People's Climate March is part of a worldwide campaign to persuade global leaders to act decisively on the issue. Marchers created a noisy carnival atmosphere as they filed through Manhattan's West Sida. Many were dressed in costumes associated with indigenous groups others wore protest T-shirts. One banner in the shape of a road sign warned "Climate Crisis Ahead". Many chanted slogans, others played music. Twelve-year old Marija Borozan from New York City was on her first ever protest march. "The world matters" she said, "I want to save the environment," she told a reporter from UN Radio. Similar climate events were reported in 2,000 locations around the world. Ricken Patel, the Executive Director of the march organizers Avaaz, said it was crucial for people to get out onto the streets. "It's important because there's a huge gap between the action our survival requires…and the action our Government are willing to take," on climate change, he said. "The street is where we close that gap." The People's Climate March is campaigning, amongst other issues for curbs on harmful carbon emissions which contribute to global warming. "We are rushing headlong into catastrophic tipping points in our climate system," said Mr Patel. "We need action fast to transition to a 100 per cent clean energy economy." 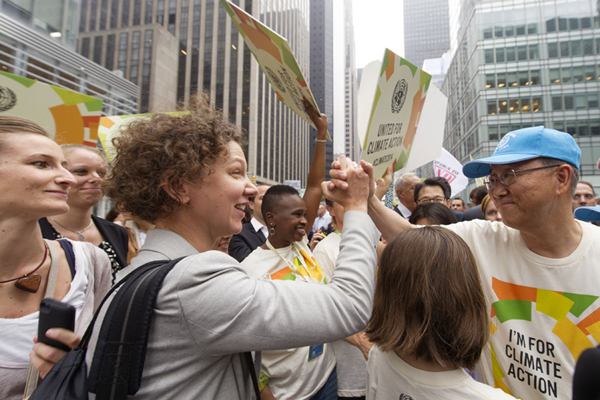 The UN chief joined the march with the New York City mayor, Bill de Blasio as well as the French sustainable development minister, Ségolène Royal. Mr. Ban's Climate Summit on Tuesday, 23 September, is expected to draw more than 120 heads of State and Government to galvanize action on climate change. He said he hoped what people were saying at the march will be "truly reflected to the leaders" when they meet two days from now. "Climate change is a defining issue of our time," he added. "There is no time to lose. If we do not take action now we will have to pay much more." It is expected that Governments will come to the Summit with concrete initiatives and that it will provide significant momentum for a global agreement on tackling climate change. It is hoped a deal will be reached in Paris, France next year. Secretary-General Ban Ki-moon on Sunday said that there is no "Plan B" for action on climate change as there is no "Planet B."